We are happy to accommodate any dietary restrictions, allergies and preferences. Menus are subject to change due to seasonality and availability of the best quality ingredients. Chef’s Notes: With the approaching Chinese New Year on February 5th, we thought it appropriate to present our first course in the form of a dumpling and the ushering of good luck upon those that eat it. Luck would also have it, that it is mushroom time on the Northern California coast and with that comes the king of mushrooms, the Porcini. Bringing these two together in a silky dumpling filled with rich and succulent porcini custard. Set afloat in a deeply flavored parmigiano broth teeming with roasted mushrooms and topped with shaved bonito, we couldn’t think of a better way to say Gung Hay Fat Choy! Chef’s Notes: Some things that have worldwide appeal sometimes fall short of the shores of the United States or its popularity comes on a bit slower. Soccer (er. Football), Gangnam Style, K-Pop, Formula 1, and Celine Dion (?) have never really been embraced here quite the way they are elsewhere. The same can be said for the humble Barramundi fish. Firm and delicately textured, this fish has been prized for ages by the people of the South Pacific, but it’s popularity to the American dining public is on the rise. Here we pan roast and butter baste this lovely delicacy placing it atop braised agrodolce radicchio and finish it with a rich truffle and black trumpet sauce. Can’t say it’ll be headlining Vegas, but it’s putting on a great show this month at The Kitchen. Walk around. Visit and sample at chef stations. Enjoy our garden patio. Relax by the fire. Chef’s Notes: With Valentine’s Day falling firmly in the middle of our Late Winter Menu, we think of blush on the cheek when a little romance and emotion are concerned. In fact, Charles Darwin stated in his book ‘The Expression of the Emotions in Man and Animals’ that blushing… “(is) the most peculiar and most human of all expressions”. While our cheeks our rosy, let us have some that are tender. Heirloom pork cheeks braised to succulent peak then crisp fried and tossed with black garlic and tamarind. Nestled atop a creamy celery root remoulade finished with a hint of mustard, we have something else you might fall in love with. Chef’s Notes: The warmth of the holidays is over, and the chill of late winter is taking hold. Thoughts of warm summer evenings with friends and family dining languidly over meals of grilled meats and garden-fresh tomatoes fill one’s mind…well it did ours too. So here is our winter version of that summer meal. Rich Montana beef is braised then grilled crispy and tender then bathed in a sun-dried tomato jus. 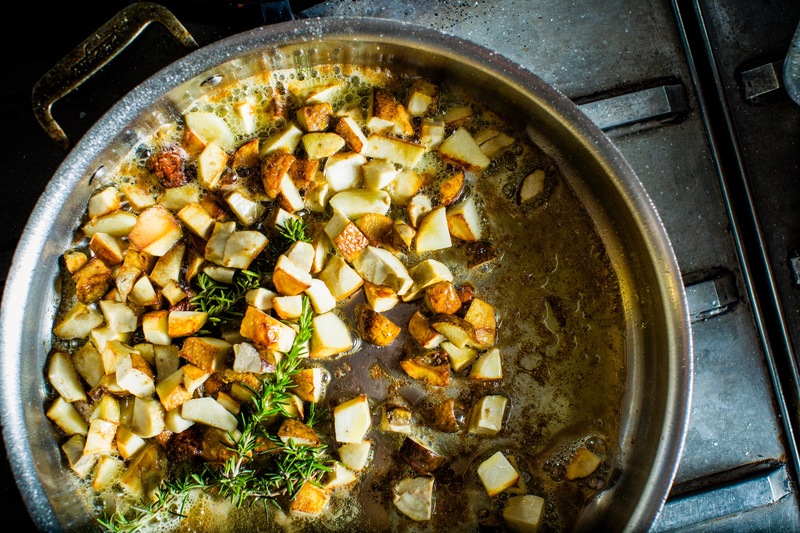 Playing foil to this is delicately light potato gnocchi finished with a hint of rosemary. We can’t have the summer nights yet, but at least we can eat like one. Chef’s Notes: We believe the saying goes, ‘the way to a man’s heart is through his stomach’, but we all know the way to a woman’s heart is through dessert. To distill this even further, chocolate and caramel hold a very special place, or so it’s been our experience. With this and Valentine’s Day in mind we offer our Dulcey chocolate tarte. Set off with flavors of salted caramel and brown butter with high notes of blood orange, what better way to express our love. Bon Appetit!